Jessabella Reads: Baby Alert: Any day now.....plus important blog info and news!!! Baby Alert: Any day now.....plus important blog info and news!!! and while my boyfriend and while we weren't planning on having another child so soon...it just kind of happened! Ya ya...I know!!! Well, now I am 3 days away from my due date which is 5/22. So yes...any day now we will be adding a new baby girl to our family! 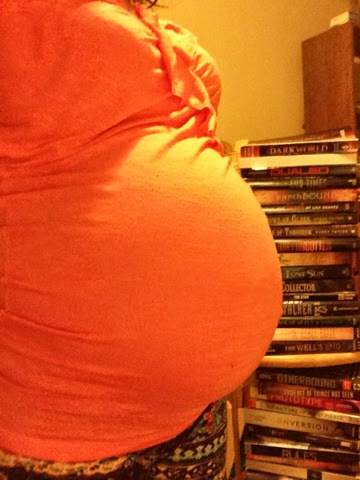 Good news: I just finished my online classes for college and with my baby due any day now....I should be able to get back to writing reviews for all of the wonderful books I have read over the past couple of months! I have a bunch of awesome author interviews, reviews, and blog tour stops scheduled for June! Basically, June will be jam-packed with awesomeness!!! I hope you guys understand my less than stellar amount of review posts lately, but know that I have read a ton of great books lately that I cannot wait to share with you all (and some finished copies from the publishers to giveaway when I post the reviews!). Also, as my side-bar states...I am planning a huge giveaway to celebrate the birth of my second daughter. I have been thinking about what to include in the giveaway, and though I am not going to tell you exactly what that's going to be, trust that it will be EPIC!!!! P.S. - I am considering holding interviews for a reviewer(or two) for Jessabella Reads. I have been thinking that with the new baby coming, and less time on my hands, I really only want to read/review books that interest me. Therefore it seems like a good idea to find an awesome book lover or two who enjoy genres that aren't really my thing. Let me know what you guys think of this idea...I would really like your input on whether it's something you would support or not. Thanks so much all of you for following Jessabella Reads! I love this blog and love all of my followers! Every comment makes me so happy, and I appreciate each and every one of you! I think congrats to you lovely mama!